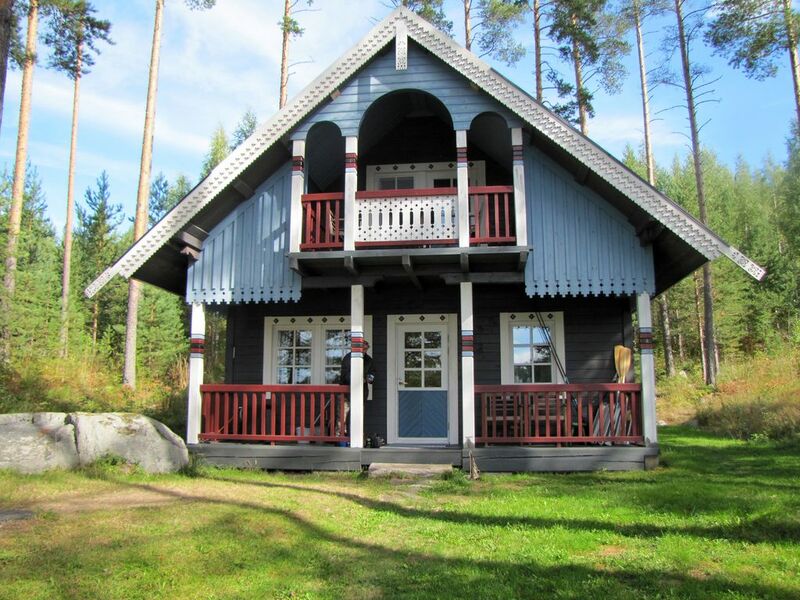 Spacious cottage on an island in Lake Puruvesi. 3 bedrooms, sauna, 2 fireplaces, balcony m. Lake views, private beach. The house is located directly on the beach on an island in Lake Puruvesi clear. Untouched nature and the excellent fishing opportunities are especially interesting for nature-loving tourists. 1 motorboat (5hp), 1 Canoe, 1 small sailboat and 1 rowboat are for use on the sandy beach. The mainland, after about 8 minutes. Boating can be achieved. The kitchen of the house is equipped with gas stove and refrigerator. The power supply is provided by solar power. Three bedrooms on two floors can accommodate up to 6 people. A wood-heated sauna with washing facilities conveys a typically Finnish bathing atmosphere. The dry toilet is located in a separate building. Because of the diverse and sensitive fauna animals are not allowed. Transport service on arrival or Departure from the train station, bus station or airport to reimbursement of expenses possible. The fuel tank of the motor boat will be handed over full on arrival. On departure of the tank is to be returned filled. The house is swept clean. Solar power system with 12- and 220 volt supply (Weak consumers such. B. Mobile phone charging). Puruvesi lake near the village Kerimäki.